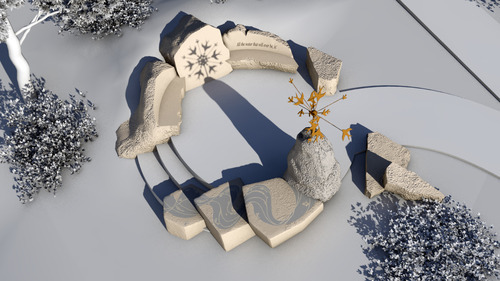 Art • $300K sculpture will be built on bank of Ogden River. Ogdenites soon will be able to watch as the city's most expensive piece of public art is created to celebrate the Ogden River and its ecosystem. Denver-based artist Andy Dufford won a design competition, which drew 137 artists from around the country, with his sculpture, "Water Cycle." The massive stone and metal work will commemorate the Ogden River restoration project and celebrate Utah's watershed, say city officials. Dufford is scouting Utah for boulders and will begin work on the sculpture immediately, said Ogden City Arts Director Ginny Stout. City officials are encouraging citizens to watch the progress of the $300,000 art work that is expected to be completed this summer. It will be installed adjacent to a planned park at 19th Street and Grant Avenue. "We wanted a work that was beautiful and durable but also a work that would create a connection between the community and the newly restored Ogden River," Stout said. "We really have a natural gem [the river] right in the middle of downtown. We want to create a sense of stewardship." Dufford's piece is inspired by northern Utah's annual snowfall runoff cycle. The ecosystem will be symbolized by a metal shape that depicts a flock of birds. At noon on the winter solstice, the sun will cast the shadows of the birds onto a stone slab in the image of a snowflake. In the summer, children will be able to pump water from a carved stone. Dufford's sculpture consumed more than half of the city's One Percent for Art Fund  one percent of money spent on city capital improvement projects is held in reserve for art. Ogden city Chief Administrative Officer John Patterson said city officials agreed with the selection committee's impulse to do something substantial with the fund, "We wanted to do one 'Wow!' project with the money that would be significant." So far, most of the money from the One Percent fund has gone into outdoor art, ranging from sculpture to metal work to neon, Patterson said. "Ogden's art is very much people's art. It's out there for people to see and enjoy and walk around," he said. "Every citizen can enjoy it outside."